One daytime runner and one under lights at night for the stable on Friday. Pedro Ximenez runs in the afternoon at Benalla while Loyalty Man starts a new campaign at Moonee Valley in the evening. Pedro Ximenez (pictured) is in race seven, the Benchmark 64 Handicap over 1606m with Kentaro Usui to ride. It is the first start this preparation for Pedro Ximenez and Mike Moroney expects the distance to be on the sharp side for the five-year-old. 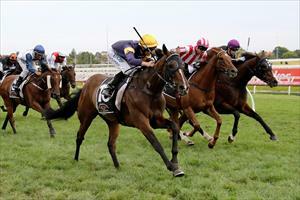 “He won over 2400m at Caulfield last preparation but this looks a nice spot to get him started,” Moroney said. “He’s had a couple of jumpouts to prepare and it’s good to give Kentaro a chance on race day. “He’s been riding work for us for several weeks now and knows what he’s doing. He was a champion apprentice in Japan and he knows the horse, having ridden him in some work at home. Loyalty Man is equal top weight for the last race of the night at Moonee Valley, the Benchmark 90 Handicap over 1200m with Patrick Moloney to ride from barrier one. It is the first start in over 12 months for the six-year-old, who suffered an injury when he was in Sydney last campaign. “He’s back and in good order,” Moroney. “He had to have some time off but it’s been good for him and he looks terrific.